A colour photograph of the 10th anniversary celebration at Cullen Gardens and Miniature Village. In this photograph Mayor Bob Attersley is greeting Batman. 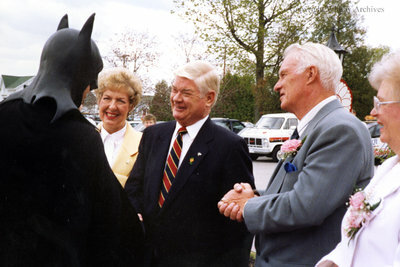 Left to right: Batman, Joan Attersley, Mayor Bob Attersley, Len Cullen, and Connie Cullen. Cullen Gardens 10th Anniversary, May 1990, Photographer Unknown. Whitby Archives A2013_042_068.